Home Our Faculty and Staff Joint Faculty Lynne E. Meyer, Ph.D., M.P.H. Dr. Meyer is the Medical Educator in the Graduate Medical Education office through the University of Florida’s College of Medicine where she focuses on program accreditation, program evaluation, faculty development, patient safety and quality improvement. 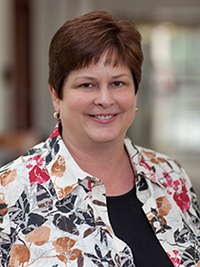 Her prior work experience includes serving as an Executive Director for the Accreditation Council for Graduate Medical Education (ACGME) and as an Assistant Dean for Medical Education and Evaluation for the University of Illinois College of Medicine at Peoria. 2006 M.P.H., Community Health Sciences – University of Illinois at Chicago, Chicago, IL. 1996 Ph.D.; Education and Organizational Leadership, College of Education, University of Illinois at Urbana-Champaign. 1986 Ed.M. ; Education, University of Illinois at Urbana-Champaign. 1984 B.S. ; Occupational and Practical Arts Education, University of Illinois at Urbana-Champaign. 1982 A.A.S. ; Dental Hygiene, Parkland Community College, Champaign, IL. Beeson, M., Carter, W., Christopher, T., Heidt, J., Jones, J., Meyer, L., Promes, S., Rodgers, K., Shayne, P., Swing, S., Wagner, M. (2013). “The Development of the Emergency Medicine Milestones.” Academic Emergency Medicine: 20: 724-729. Beeson, M., Carter, W., Christopher, T., Heidt, J., Jones, J., Meyer, L., Promes, S., Rodgers, K., Shayne, P., Wagner, M., Swing, S. (2013). “Emergency Medicine Milestones.” Journal of Graduate Medical Education: 5(1s1): 5-13. Vydareny, K, Amis, E.S., Becker, G., Borgstede, J., Bulas, D., Collins, J., Davis, L., Gould, J., Itri, J., LaBerge, J., Meyer, L., Mezwa, D., Morin, R., Nestler, S., Zimmerman, R. (2013). “Diagnostic Radiology Milestones.” Journal of Graduate Medical Education, 5(1s1): 74-78.